Boy, is that ever pretentious sounding, but hear me out on this one, please! The original Eduard Me109G family was, to put it mildly, somewhat hosed, a gorgeous kit that was, in more ways than one, too big for its britches. It was, as the manufacturer told us, the ultimate kit of the ultimate Second World War fighter but at the end of the day it was so badly flawed as to be useless to any but the most casual of modelers. Or was it? Then there was the Eduard Tempest, the only decent 1/48th scale kit of the very best British propeller driven fighter of the Second World War, flawed by a fuselage that was entirely too short to be of use to any serious modeler. Go back a few years, or maybe a whole bunch of years, and take a look at Revell's P-51B in 1/32nd scale, advertised as The Next Great Thing at the time of its release but woefully misshapen and virtually useless as an accurate representation of any sort of Mustang. In 1/72nd, that itty-bitty scale that I honestly can't see all that well any more, we had Revell's Tempest Mk V and P-51D, along with any pre-Airfix Mk V Spitfire kit, and a host of others. And the beat goes on. It seems like something new is being released almost weekly these days, and there are literally thousands of old kits still out there as well, which means the chances of some manufacturer messing up their tooling and producing an inaccurate model are pretty darned good. We've already discussed Perfection and its complete and total unachievability (a word I may have just made up but still a word when all is said and done!) and have had that discussion more than once. To me it's one of those Basic Truths of our times---you can't fix Stupid, nor can you have a perfect model airplane. You can, however, have a pretty darned good model airplane if you do your part in the ongoing drama and that takes us to a quandary of sorts. Let's say your own personal skill sets are pretty good, and you can reliably turn out high-quality model airplanes on a fairly consistent basis. You've become a silk-purse-from-a-sow's-ear kind of guy or gal, and you can make almost anything made out of polystyrene or resin look good. That's more than commendable and makes you a superior modeler of sorts, but it's only half the battle. The other half is scale accuracy, which means it's time for a brief journey down Philosophy Lane. Just how accurate is accurate? Can we define that in any measurable way, or is it just something we discuss when we're around other modelers? It's a question that's almost Shakespearean in its nature, because there's a big old rub hiding in there! At the risk of repeating myself, and realizing that mere risk has never stopped me from doing that very thing before, I have to say that ours is a subjective hobby at best. Yes; there are engineers and artists out there, and most modelers are a combination of the two, but in every instance the modeler is more of one thing than of the other. The engineers want Polystyrene Perfection, and the artists want a viable representation of the real thing that's pleasing to the eye. It's one of those deals where nobody's right and nobody's wrong or, to put it another way: I don't know art, but I know what I like. So here's the point: I personally won't waste my time on a known bad kit unless there's just nothing else out there to work with and my life can't go on without a model of the whatever-it-is on my shelf. The problem is that our previously aforementioned Life is just too darned short, ya'll, and for some of us it's getting shorter with every passing day. Does that mean I've finally sold my saddle and gone over to the Don't Really Care side of the hobby? No; not at all. What it does mean, at least to me, is that I can now let some things (not many, but some) that would have made me bat-poop crazy a few years ago slide or, to put it another way: If it walks like a duck, talks like a duck and looks like a duck, then there's a pretty good chance it really is a duck. The current Eduard Fw190 kits walk like, talk like, and look like Fw190s when they're completed, but they aren't all that accurate as scale models even though they really and truly do look the part sitting there on the shelf. They're an anomaly that helps to prove a rule. If the kit is reasonably to scale (and that's by your definition, not mine) and reasonably accurate (again, by your definition and nobody else's), and if you're happy with it as it sits in your collection, then it's probably a pretty good model. There are no perfect kits out there, and there never will be. There are some pretty good ones, and a great many adequate ones, and some really bad ones too, but there are no perfect ones. That gives you an opportunity to pick and choose, and to do the best you can. Should you listen to others while you're doing this? Absolutely! Should you care about what others think of your work? Yes you should, but with a huge caveat. This is a hobby and, most important of all, this is your hobby. I have personal standards and I truly do try to raise the bar a little each time I build a kit, but at the end of the day I'm building for my own personal pleasure and gratification. I enjoy the time I spend at my bench and I feel pretty darned good when something comes out the way I wanted it to when I began the project. If someone else likes it too then that's gravy, but at the end of the day I'm building for myself, because it's my hobby. Good enough can sometimes actually be good enough, even on an old or obsolete kit. Perfection isn't in the game at all. Let's take a brief ride in the Wayback Machine today and take a look at a photo we could've/should've but didn't run way back in our second print issue when we profiled Stanton Smith. Many thanks to Jim Wogstad for discovering this photograph and realizing that I couldn't live without it! The clip is 10 or 12 minutes long and is about Nationalist Chinese Curtiss Hawks engaging Mitsubishi G3M-1 bombers during the Sino-Japanese War. The CGI is nothing short of spectacular, and the airplanes behave the way real airplanes do in flight---none of the exaggerated aeronautical miracles found in recent movies are present here and all the action is extremely believable. We do, however, have a couple of criticisms of the clip. The first is a technical glitch---early on several of the Hawks show backwards side numbers, either an editing glitch or a deliberate ploy to catch Picture Pirates. The second problem is more one of taste in that the clip is just too darned short! The CGI is breathtaking and the clip appears to be from a real movie which we think may be called "The Bridge", although we aren't certain of that---there are real non-aviation actors in parts of the clip, however, so it almost has to be from a greater work. This is a must-see if you're an aviation enthusiast. Many thanks to Rick for sharing it with us all! I am, of course, talking about the recently released Airfix P-40 B kit in 1/48th scale. It's a model who's release was greatly anticipated; one that fueled storms of discussion and debate even before it became available for examination, much less actual building, and that debate terminated at least a few friendships and caused a couple of people to be dismissed from various on-line forums. It was, and perhaps still is, a kit that arouses considerable passion in the hearts of those who choose to build it. That's not for discussion today, however. I've always admired the airplane as an example of aeronautical art and, like a great many people, I've also bemoaned the lack of a 1/48th scale kit of the type that might prove to be a significant improvement on Monogram's seminal but distinctly long in the tooth 1964 release. The New Airfix has been doing good things in my opinion, which made their P-40B well worth investigating so, with all the reviews and tooth-gnashing in mind I called a local shop and asked them to hold a copy of the kit for me as soon as their stock arrived. What follows is what I think of the kit after building it, but I'm going to go ahead and tell you right off the bat that I like what Airfix did for the most part, and I honestly think most of you will like it too. Keep in mind, though, that this site doesn't do kit reviews, so you're not going to hear what color the parts are or how many of them are in the box---you probably don't need me to tell you those things anyway, right? Anyhow, there is one caveat regarding this kit that almost everyone who did actually review the model has mentioned; the fit. A lot of folks say it's too good, and too precise, and and they aren't awfully far from being right. The tolerances for this kit, and almost all of Airfix's recent releases for that matter, are incredibly precise and you need to pay attention to what you're doing if you plane on building a decent model. This is not a kit for the novice or ham-fisted. Some modeling skills and a little patience are required, and if you don't possess those things your chances of a harmonious outcome are slim at best. With that as a baseline, let's move on to the things that will matter to you when you build this kit. You can build any of the long-nosed P-40s from this kit but you'll have to reconfigure the landing gear and address a couple of other issues if you want to build one of the early P-40-CUs. The other American variants (the B, C, and G) can be built from what's in the box, as can the Hawk 81 family, which was the primary export version. My model is of a P-40B so we're going to talk about the American versions here, along with some basic, and minor, corrections to the kit. The kit represents the external rudder hinge on both sides of the rudder, but it's only on the port side on the real airplane so you'll need to remove it from the starboard side. You might also consider removing it from the port side and replacing that one with fine wire should you be so inclined---it'll look a lot better if you do that. That rudder has a trim tab in it, and the guys at Airfix only molded it in the starboard side of that part. It's easy to scribe it in on the port side too and you really want to do that. The parts breakdown for the nose of the model is extremely effective in dealing with the complex shapes found up there, but I think there's an easier way to do the resulting assembly work. I added the side panels that live just above the exhaust stacks before the fuselage was assembled, applying Tenax from the back-side to lock them in place. It was easy to do and it worked, although you might prefer to follow the kit's instructions there. The choice is yours. I did the same thing for the wing fillets, adding them while the fuselage was in halves. It made things a lot easier for me, but you might not be comfortable doing it that way either. There are a couple of small access hatches that live in the port wing fillet. Airfix forgot to put them there (and I did too!) but they're easy enough to scribe in place and you really ought to do that. Everything else was done per the instructions and worked out just fine, thank you. The completed model really looks like a P-40B too, and some of the details (formation and navigation lights, gear doors, etc) could serve as an example of how to do that sort of thing for the other manufacturers out there---they're petite and very much to scale! This view shows how the fuselage panels were inserted prior to assembly. If you're careful here it will simplify things later on and remove the possibility of sanding and puttying around the nose from your life. The wing root fillets were done the same way. It's easy to install them at this stage of construction, but things might get a little tougher once the fuselage is buttoned up, although I didn't try it that way so I honestly can't comment on it. This is also a good time to install the radio compartment hatch, once again cementing from the back side. A picture that's worth a bunch of words! Do your installation a half-inch or so at a time and things will line up perfectly, while a "hot" solvent such as Tenax will ensure those fillets stay where they're supposed to! It's beginning to look like an airplane now. I usually build these things in a modular fashion nowadays, but it was easier to do this one by sticking all the big pieces together the old-fashioned way. It's really starting to look like a P-40B, isn't it? Here it is with all the big pieces attached and the decals applied. There's a ways to go yet but you can tell Airfix did their homework, can't you? And this is where I'm going with the project---a P-40B from the ill-fated 20th PS of the 24th PG as stationed in the Philippines at the start of the war. I'm liking it so far. So let's summarize. Is the Airfix P-40B the ultimate kit we all wanted it to be? In all truth, it is not, but it isn't that far away from it either. The major issue with the kit are the overdone panel lines it's festooned with; most of the kit's detail, including the interior, is excellent, petite, and very much to scale. The prop and, to a lesser extent the spinner, is a clanger, but that's easily fixed by the use of an UltraCast replacement (presuming it bothers you enough to make you want to replace it). The decals are perfectly usable, as are the clear parts, and the engineering of the overall kit is impressive indeed. As for that "nun's hat"---somebody's going to have to provide a lot more evidence than we've heretofore seen before I decide it's a serious enough problem to require my attention, but you may well choose to do it. On the other hand, that impressive engineering we just mentioned is also a major pitfall if the modeler doesn't have the skill-sets or experience necessary to work with them. I meant it when I said the kit's tolerances are on the tight side---every single piece on the almost-completed kit you see above fit perfectly, but every single piece was also carefully trimmed and dressed before attachment to the model. I personally enjoyed building this thing and, thanks to the largess of an old friend of mine, have a second kit waiting in the wings that will probably be built sooner rather than later. Thanks as always to Jim Sullivan for his talent with a camera and his willingness to share both with us! 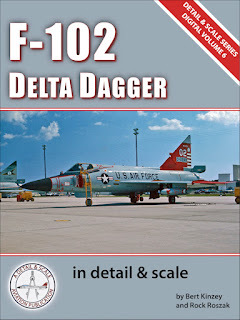 F-102 Delta Dagger, Bert Kenzey and Rock Roszak. Detail and Scale Publications, 2017, Electronic monograph, heavily illustrated. We recently came by this title through as a result of a series of e-mails with one of its authors, Rock Roszak, a correspondence that caused us to jump headfirst into the wonderful world of electronic books. There's a story behind D and S's conversion to that medium, of course---one that we'll save for someone else to tell---but the books are here and in a format that many of us would not normally use or seek out. That could be a mistake on our part. Most of us are well familiar with the old Detail and Scale series, a family of books who's history stretches back a great many years. 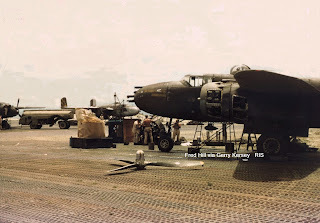 They're so familiar, in fact, that we aren't going to describe them for you since pretty much every aviation enthusiast on the planet knows what they are, but rather jump straight into a look at the current presentation. In the most basic sense the D and S electronic volumes are no different than the print books that we're all so used to yet they are, in the same breath, considerably different and much improved. Everything that endeared the old print edition works to us is still there; a brief history of the aircraft in question plus pages of detail photography of the actual aircraft slanted at the modeler are an essential part of the books, but in many respects that's where the similarity ends. These newer, digital editions, are much more comprehensive in terms of squadron usage than the old print editions could ever be, and the presentation of both photography and printed material is far better than before, and considerably more comprehensive (even to include pilot's narratives in this particular edition). The page layouts are improved and the overall product is quite impressive. Add to all that a substantial reduction in cover price and the books begin creeping towards the Must Have category of references. 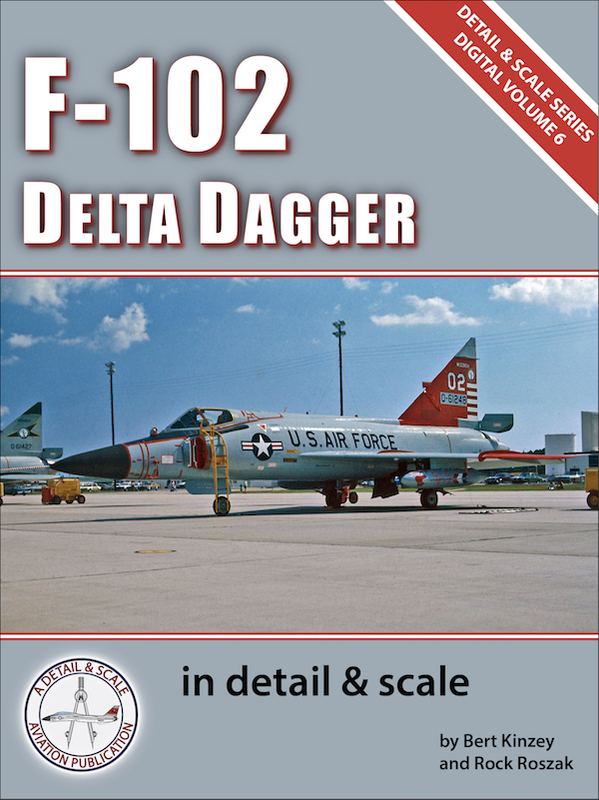 The volume we examined, that for the F-102, also included a comprehensive selection of photography covering every unit known to have flown the "Deuce". That said, we do have one reservation, albeit a personal one. While the electronic format truly does broaden the scope of possibilities with these books, it also limits access to them to those with a computer, I-Pad, or similar. In a similar but completely different vein, it also eliminates the tactile experience gained by having and reading a "real" book of the old-fashioned print variety. Our experience with this particular title makes us think there's a lot to be said for the format and presentation, as well as the sheer amount of material that can be presented for a substantial reduction in cost to the consumer, and there's little doubt in our minds that E-Books are the way of the future.That said, your humble editor is what some folks might call a curmudgeon, one who likes holding a real book and turning its pages. Still, the writing's on the wall, isn't it? It's been a while since our last edition (and Yes; we really do have A2F and SB2C photo essays in the works, we promise! ), but we've got a couple of comments to share with you today so let's get to it! Variant: A-4F Unit: VF-126 (Also listed as VA-126) BuNo: 154181 Modex: NJ-620 Date: c1983. Description: right front view of VF-126 Skyhawk BuNo 154181, NJ-620, parked on the ramp. Location: NAS Miramar (as indicated by the NC-8A in the background). 154181 was assigned to VF-126 as NJ-620 (or NJ-625) between 1978-92 when it was retired to AMARC. URL to complimentary Photo http://a4skyhawk.us/content/154181-vf-126-photographer-unknown-g-verver-collection-4102 Hope this is of some help. This is regarding the picture of the SBD-5/RA-24A with the mystery gear on and under it. This is indeed the QF-24A-DE drone aircraft the USAF used for testing in the late '40's. I found the picture on your site while I was looking for information on that particular craft because I met the man who "flew" it during test in the Air Force. I'm currently building a commissioned B-25 model for this gentleman an he told me all about his career in the AF and the odd turn it took after he completed flight training on the B-25J gunships to be sent to the South Pacific for the Air Apaches. Because of Navy concerns about the security of ships in the area where the planes were due (we had been temporarily chased out by Japanese forces) they cancelled the shipment until the area was under Navy control again. By that time this gentleman was sent to assorted temporary duties and when the planes finally left the US he was bust at Wright Field with something else. Because he had been a radio enthusiast before the war and was still tinkering with them to try to make remote control planes while in the service he was tapped for a position in the new high-g program where the AF was testing new types of G-suits for our crews to use in combat. 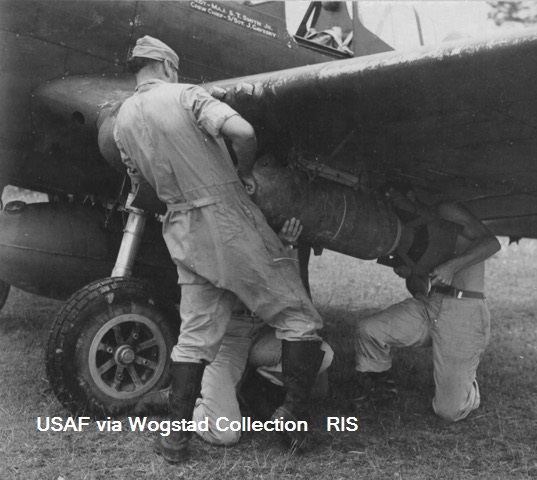 The newer planes were giving crews a lot of problems in dogfights and the AF was using a drone to help figure out the solution. They needed someone to help work out the kinks in the drone and then fly it during the tests. My customer was it. He told me today that he flew in a B-25 in the nose compartment with his radio gear while test pilots wearing the various g-suit designs would ride in the Dauntless. 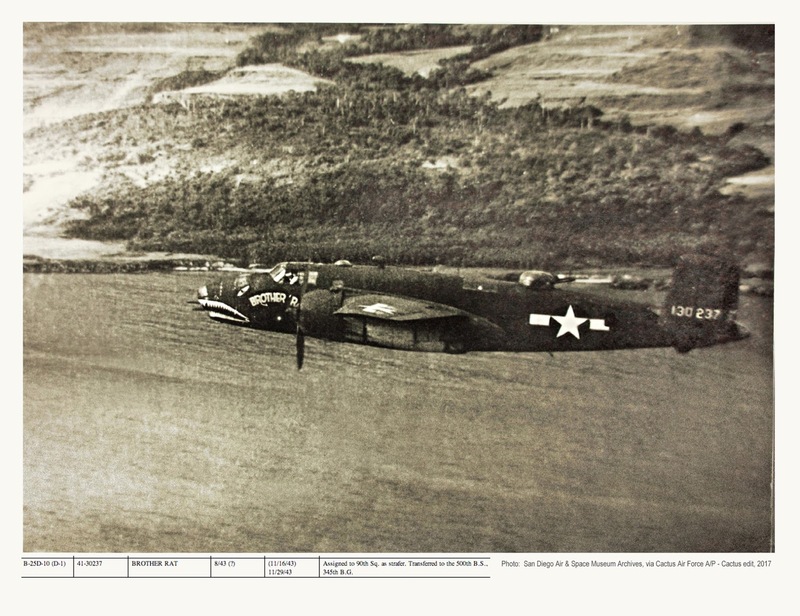 He didn't remember the number for the SBD (he is 98 years old, and while sharper than I'll expect to be he is fuzzy on those kinds of details) he did remember it was the only one the AF had. Apparently the USAF had chosen the Dauntless for this task because it could pull so many hard g's and still hold together, as well as be easy to control and recover. So the test crew would be strapped in with pressure bottles for the suit bladders, then EC (his initials...I haven't asked if he wanted to be named yet since I just found this article) would fly the drone through the test maneuvers as the crew would note the effects of the suits and perform various tasks to see how alert they were during the same. By using the drone the USAF hoped to avoid crew casualties from blackouts that couldn't be recovered from in time to avoid a crash, especially during multiple maneuvers in succession to simulate combat. 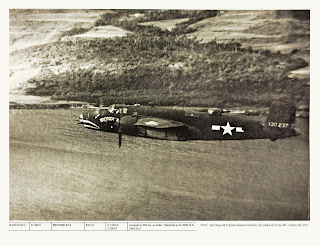 The problem of making it through a high-g recovery in a dive bomber was considered top of the list, since our side didn't have the sort of recovery device the Germans had on Stukas for that, and the Helldiver and Dauntless could pull even more g than that plane did. EC told me the SBD had cameras inside and out to record the tests, and extra radio gear for backup, but was pretty much just a stripped down SBD-5. He remarked on the perforated dive brakes and how well those worked at holding the plane's speed down in a dive before he pulled them in and yanked the drone out of it to try to black out the crew. Sounded like a hard dollar for those guys to me! EC also flew hands-on drone planes that were used for evaluation of remote feedback of the instruments during remote flight. This would eventually allow operators to fly the drones out of visual flight range and was the first steps in early remote guided missiles and recon craft like the Vietnam-era Quail. Nowadays he lives in Washington just 3-4 hours from me. So there it is, the story of your Mystery Bird! It really floored me to see this picture on your website right after getting the model commission and interview with the man who "flew" it. 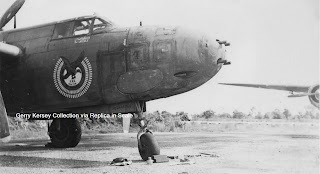 Scott, thank you very much for sending this to us and helping to clarify the mystery regarding that airframe! On a final, but necessary note, I'm pretty sure this issue of the project is later than, or at least in contention for that honor, anything we've previously published. To those of you who have contacted us with concern, please don't worry---all is well and we're chugging right along over here. My wife and I have been heavily involved in moving her ailing mother from Florida and establishing her in Texas over the past several weeks and the activity has consumed a LOT of our time. In theory things are back to normal now---fingers are definitely crossed on that one! We're also extremely fortunate in being far enough west of the Texas coast to have missed almost all of the bad weather that's been so much in the news of late; thanks very much to those of you who have asked about us and our well-being over the past week. We're ok, but we'd like to give a heartfelt thank you to all those who were concerned about us and ask you to turn your thoughts to the folks who actually did get slammed by that storm. And that's it for this highly delinquent issue! Be good to your neighbor and we'll meet again soon!